The Architect of the Capitol manages all of the buildings and grounds on Capitol Hill, but also oversees several facilities around the National Capital Regional. One of which is the U.S. Botanic Garden (USBG) Production Facility. I recently had a chance to tour the facility and learn about the efforts that go into maintaining one of the oldest botanic gardens in North America. The USBG Production Facility is located in D.C.'s Anacostia neighborhood, about eight miles from Capitol Hill, and is home to some of the world’s most exotic and beautiful plants. The facility opened in 1994 and, at 85,000 square feet, is the largest greenhouse complex supporting a public garden in the United States. Employees from the USBG travel to and from the Conservatory on Capitol Hill and the Production Facility on a daily basis, depending on the work needs of each site. And as anyone that has cared for a garden knows, there is always plenty of work to be done. As someone who has struggled with caring for only a few types of flowers at a time, I was particularly amazed with the size of the facility and the number of healthy plants that fill its rooms. The USBG currently has approximately 60,000 individual plants to water, track and nurture. As seasons and exhibits change, most plants reside at the Production Facility. There are 16 growing zones, each one adjusted to precise light, temperature and humidity settings to ensure the plants' optimum health. Bill McLaughlin, curator of plants, led my tour through the growing zones, each room warmer than the last, summarizing the smells, colors and other interesting features of each room's residents. McLaughlin noted the unique role the USBG staff has as they work with such diverse, living clients. USBG employees and volunteers work day and night to fulfill each species' individual needs. The feeding, watering and fertilizing schedules are carefully maintained and recorded by staff to ensure the plants receive exactly what they need to flourish. "Our gardeners bring a personal interest and passion for plants to their work. They are personally invested in seeing the plants under their care thrive," McLaughlin said. The USBG Conservatory is open year round and the work is never done, but it's easy to see the care and pride the USBG staff put into ensuring their clients have a home that is well suited for their needs. Members of the public also have a chance to tour the Production Facility, meet the gardeners, and see rare and endangered species not always on display at the Conservatory at an Open House event held annually in March. 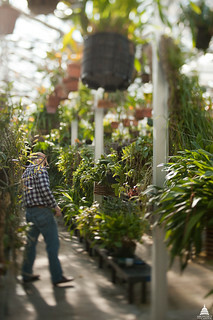 Learn more about the U.S. Botanic Garden at www.usbg.gov.